Before I review this headlamp, I have to put some things in perspective. I’ve been guiding for CMS for 20 years now. Whether I like it or not, that makes me an old guy. And like many of my old guy compatriots I’m not particularly tech-savvy and I don’t really like change. For example, I still have a land based phone and I have staunchly avoided Facebook. While I’m not a total Luddite, some of my techy friends have been known to call me ‘retro-tech’ or ‘slowie’. While all this may seem quite beside the point, stick with me - it will eventually make sense. I’ve been guiding for 25+ years now and so I’ve spent a good portion of my life doing middle of the night approaches. Thankfully, I’ve done far fewer middle of the night descents, though I’ve done my share of those as well. 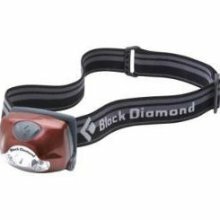 I’ve always preferred headlamps that have 2 straps (one around your head and one over the top) because I have a prima donna skull and I get headaches easily when my hats, helmets, or headlamps are too tight for an extended period of time. The strap over the top allows me to keep the strap around my poor, sensitive head loose and comfortable. Two straps have always worked for me. Why would I want to change a system that’s been working perfectly well for years now?! Imagine my surprise when I started to discover some of the user friendly features on the Cosmo like the power switch that looks tiny but that’s actually easy to use even with gloves on. And the single strap is a piece of cake to adjust while it’s on my wimpy head and while I’m walking and while I’m wearing gloves. Even though all the lighting elements are LED, the 2 settings (a low power diffuse setting and a high power focused beam) are perfect for diverse needs like digging in your pack or night time navigation. And one of the coolest features is the dimmer function for both settings. Honestly, I thought the rheostat function was just a gimmick, but I actually use it often to customize the amount of light I need and save battery power at the same time. And never mind the fact that it’s pretty hard to come up with a good reason not to carry it as an emergency light in my pack every day I go in the field because it’s so light (54g without batteries). And unfortunately, as much as I’d like to blame BD for making me the grumpy old guide…I can’t! The Cosmo’s light weight means I can keep the single strap quite loose and it stays in place very nicely. So, it turns out I didn’t need the sympathy I worked so hard to generate earlier. I hate to say it, but I didn’t need to be afraid of new technology or of change…at least not with headlamps. However, I still reserve the right to be an old guy with everything else! So I guess the bottom line is: while you won’t be talking to me on the latest smart phone or tweeting with me on Twitter, you will see me pre-dawn and post-dusk happily using the BD Cosmo. Merry Christmas and Happy New Year from the happy old guide!